Families drove through for aid. 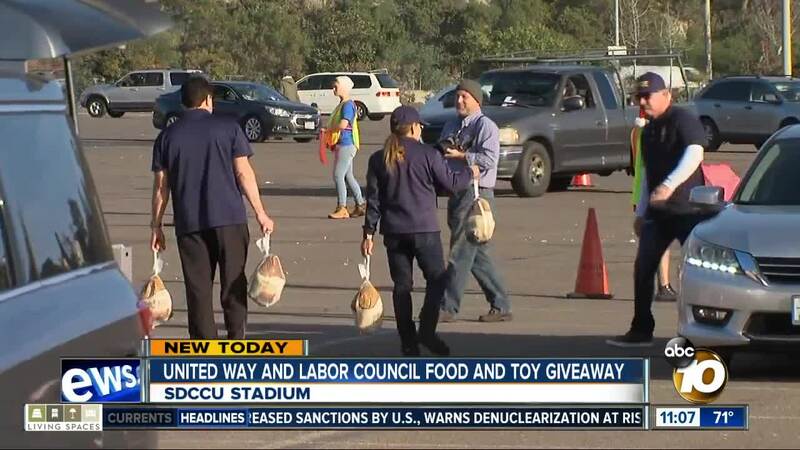 SAN DIEGO (KGTV) - A partnership with the United Way and the San Diego and Imperial Counties Labor Council pulled off a donation drive-through at SDCCU Stadium Tuesday morning that served 500 families in need. Cars holding vouchers from the various unions represented by the council lined up and proceeded through the assembly line, loading up with food and toys donated by their fellow workers. Every year, thousands of union workers make a monthly donation from their paychecks to assist their fellow working families and community members in need. This year's recipients included fire victims and other families identified by several non-profit partners, according to representatives with the Labor Council. "You've got electricians and teachers out here helping school bus drivers and janitors and security guards, those who have fallen on hard times and need a little extra help," says Keith Maddox with the Labor Council. Holding two events, one in San Diego and the other in Imperial County, 650 families total were served by the annual donation drive. Feeding San Diego helps procure the food for the drive, according to Unions United/United Way of San Diego County President and CEO Nancy Sasaki.